'Game of Thrones' Season eight is officially underway. Game of Thrones' Emilia Clarke just went full Khaleesi in real life. After years of sporting a silver-haired wig to portray her onscreen persona, Daenerys Targaryen, the actress finally went platinum blonde herself for the first time. This marks her eighth and final season of GoT—why not celebrate with a bold new look? She even got the show's official hairdressers, Kevin Alexander and Candice Banks (who are responsible for her Dany wig), to dye her hair. "AAAAHHHHHHH SHHHHIIIII****** I done did it.Mother of dragons meet Emilia. Emilia meet mother of dragons. If you squint just so you might never know. All hail to the magnificence of @kevalexanderhair and @candicebanks74 the genius creators of 'KHALEESI WIG' (and not forgetting all the hair on game of thrones for 8 glorious years) for at long last making this magical moment a reality. #khaleesikicksoff #gameofthrones#cominghomeneverfeltsogood," she wrote in the caption. The Game of Thrones cast is slated to start production for Season eight in October, which explains the timing of Clarke's transformation. 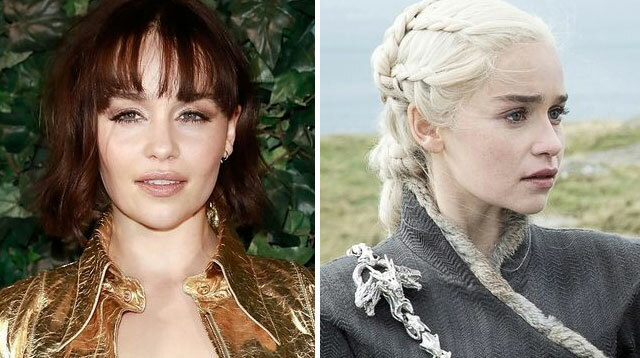 Since she still has shoulder-length hair, she'll likely continue to wear a wig to make up for the length of Daenerys' locks. But who knows, with GoT's unpredictable nature, Dany could somehow end up going with a "Cersei-cut" in next season. You'll just have to wait and see.